I had the metal tab break on one of my magazines. The other one bent so I broke it and modified that area like you did. Next time your by a gun store check out the magazine for a 10 mm Glock, The metal tab on the magazine is bigger than on the 45. I did use the Glock contact form but have not heard back from them. I asked if the would consider making the Glock 21 magazine as strong as the Glock 20 and 29 magazine. People are now using 45 acp, 45 +P, 45 Super and 460 Rowland in the Glock 21 so it needs a stronger magazine. I have thought of spot welding a piece of spring steel to replace the broken metal tabs. But don’t have a source for a spot welder. Another thing I noticed was that after disassembly of the slide. When I tried by hand to feed a cartridge past the extractor it was rough and kind of binding. So I took the extractor out and polished it with sandpaper final grit 1200. A round now seems to feed by hand into that area a lot smoother with no binding. Will test it later this week. One caution; You might want to consider. The base (CUP) area of the Rowland cartridge is supposed to be stronger. You can see the difference when you compare 45acp and 460 Rowland. MY thought would be to trim the 460 Rowland case to 45ACP case size for any future testing on case size feeding issues instead of increasing the powder charge in a 45 case. Some good thoughts and feedback there, Norm. The tip on sandpapering the extractor is a good one – something that I’ll take a look at on mine. And yeah, I think that a beefier structure to the top of the mag is the thing. If Glock won’t make the change, perhaps an after-market supplier will offer them. Just back from testing the polish job on the extractor. It made a world of difference. I had one failure (limp wrist?) to fully seat the slide, a slight hit with my hand fixed that. This was with Johnny’s Defense Against Large and Dangerous Game ammo. I only took 10 rounds the other 9 rounds fed just fine. 10 round magazine of Johnny’s duty round 1 failure to feed jam. The rest fed fine. Two different 10 round loads of hand loaded rainier 230 grain plated round nose bullets they all fed fine. 10 rounds of 45 super fed just fine. before my next visit to the range I will polish the extractor with a buffing compound to get it extra smooth. 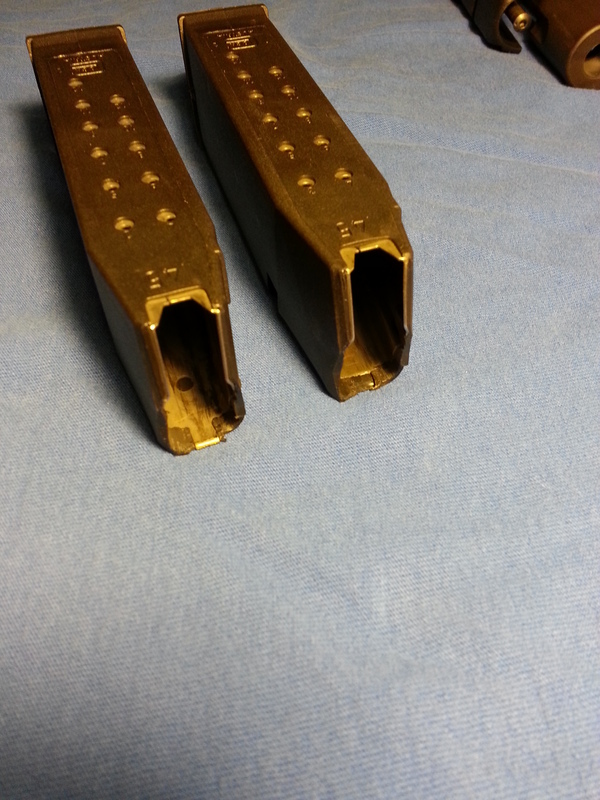 This should allow the magazine spring to feed rounds to that area even more smoothly than just the sandpaper polish job. But I am very happy with the sandpaper polish job and todays performance. 2- A 26 lb. recoil spring. Wolf Springs doesn’t have one. Wolfs website states that if the brass is ejecting farther than 8′ it indicates the need for a stronger spring. My brass on the Rowland ammo is ejecting in the 15 to 20 foot range. 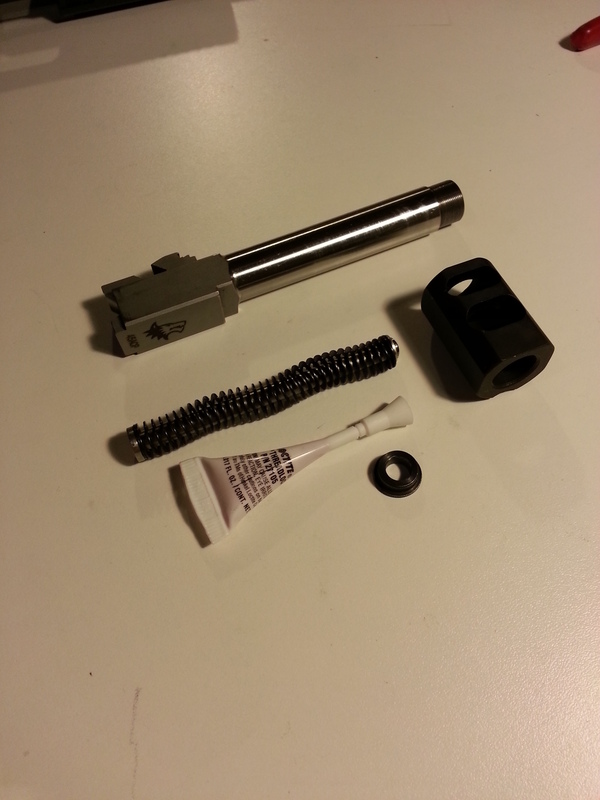 That’s with the extra strength recoil spring from Rowland and also with a wolf 24lb recoil spring. Jim your help in trying to locate a source for the above would be great. 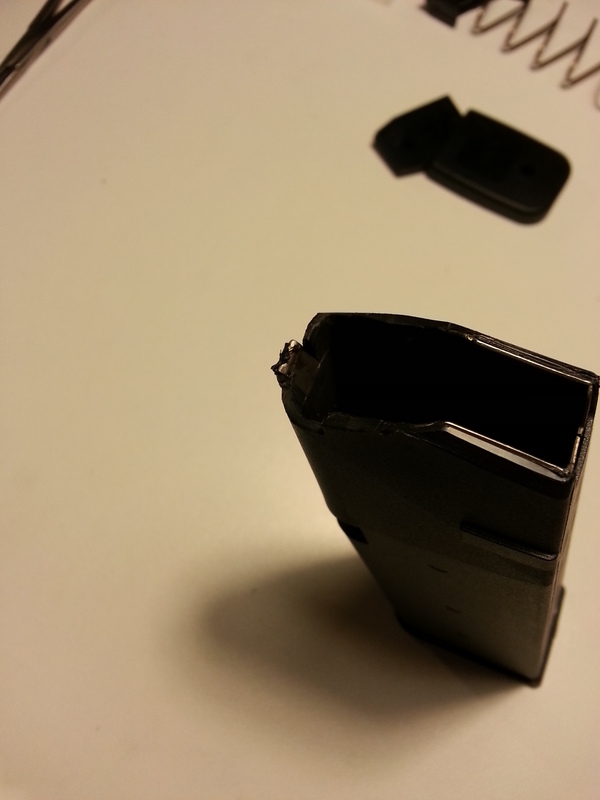 Todays shooting was using a magazine that had the metal tab broken out. I do have another magazine I will use next time I go to the range the metal tab on it is just starting to bend. I will also take a lot more 460 Rowland ammo with me, wished I had taken more today. It is a round nose so hopefully it will feed all right. Good to get the additional range report, Norm. Glad to hear that the polish job worked so well! I’m going to tap into my network of contacts and see what I can scare up for a 26 pound recoil spring. If/when I find anything, I’ll post it here. Goosebumps yes as both my reloads are with Unique. 7 grains and the other 8.5 grains of Unique. Won’t go any higher until after I get a Chronograph. The bullets are Rainier 230 grain plated round nose. Hope your contacts come through with a stronger recoil spring. I went back to the range yesterday and it did bend the metal tab quite a bit. No jams though shooting a box of Johnny’s Duty Rounds. So the buffing compound helped even more on polishing the extractor. 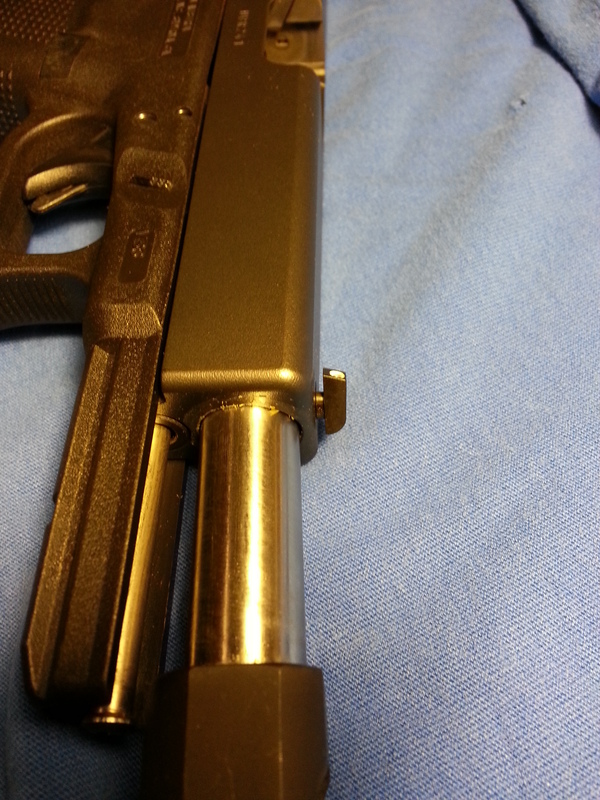 I think a 26lb recoil spring or even higher as long as the slide can be racked by hand to chamber a round is needed. This might slow the slide down enough to keep from bending the metal tab. Yeah, since that post I have come to the conclusion that slide speed is the biggest problem. I did swap out the standard mag springs for stronger ones, and that helped, but the real trick would be to either add slide weight or go to an even heavier recoil spring.